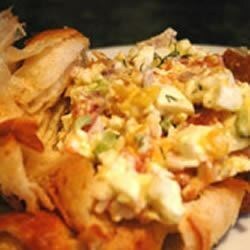 "A great change from the standard egg salad, this is fabulous served on toasted whole grain bread. It can also be spooned into hollowed out tomatoes for a fancy presentation at a luncheon." In a medium bowl, combine eggs, celery, onion, smoked salmon and mayonnaise. Season with dill, salt and pepper. Refrigerate at least 2 hours to allow flavors to combine. Delicious! I even used canned salmon and it was still terrific! I made this as an appetizer for Easter and stuffed it into those ready-made phyllo cups. We loved it. I added 1/2 the onion the recipe called for,and a good amount of salt. A great recipe! This recipe is so unique and delicious. I added a little fresh basil and cut out the red onion and it was fab-u-lous.